We are at the midway point for 2018, and the stock and bond markets are producing mixed results for investors. The broad US stock market, as measured by the S&P 500, is up 2.6% year to date through June 30th, while the broad US bond market, as measured by the Barclays Aggregate Bond Index, is down 1.6% through the same period. Overseas markets suffered a setback in recent months as a surging US dollar and trade war concerns dampened enthusiasm. The MSCI EAFE Index, which represents developed non-U.S. equity markets, declined 2.4% through the first half, while Emerging Markets stocks, after being in positive territory for the first quarter, turned negative in 2Q and are now down 6.5% year to date. In other words, halfway through 2018, a typical investment portfolio represented by global equity and fixed income allocations is roughly flat for the year. Several factors are weighing on equity markets this year. First, the looming trade war, as we discussed in our 1st quarter commentary, is escalating and appears on track to deliver higher tariffs (taxes) across a broad array of imports, which will cost US consumers. Another factor weighing on markets is rising interest rates. After raising rates three times in 2017, the Federal Reserve has hiked rates twice in 2018 and is signaling its intention to raise rates two more times before the end of the year, and possibly three times in 2019. Longer-term rates initially surged higher as the US 10-year yield rose from 2.40% to start the year to a high of 3.11% in May before settling at 2.85% to finish June. Higher interest rates represent a short-term pain, long-term gain proposition for savers and investors, a topic we will discuss in greater detail later in this commentary. One factor we believe bears watching is the surging US dollar. The WSJ dollar Index, which measures the currency against a basket of 16 others, rose 5.1% in the second quarter of 2018 for its first quarterly gain since 2016. Because the US dollar is still the world’s primary (reserve) currency, any significant change in its value and future outlook sends ripples through global financial markets. 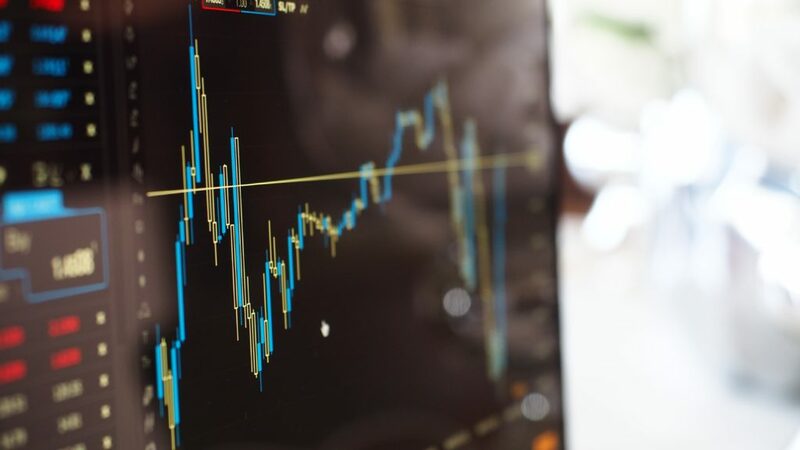 The US dollar’s recent rally and expectations of strong US growth are upending investments across the globe, punishing commodities and emerging markets while attracting more overseas money to the US. A strong US dollar makes US products less competitive abroad and reduces the profits of US multinationals when they convert foreign earnings into US dollars. If the US dollar rally continues, equity markets worldwide will likely struggle. Interest rates in the US will be a significant determinant of investment returns for the balance of 2018. As mentioned earlier, longer-term interest rates as measured by the US 10-year yield surged higher to start the year but have recently cooled off to 2.85%. By contrast, short-term interest rates – as measured by the US 2-year yield, has risen from 1.92% at the beginning of 2018 to 2.52% on June 30th. This 0.30% difference between the yields on 2 and 10-year US Treasuries is the narrowest since August 2007. Two-year yields are typically tied to Fed interest-rate policy, while longer-term yields are more responsive to sentiment about the outlook for growth and inflation. The dispersion between shorter-term and longer-term rates, known as the yield curve, is a crucial indicator of sentiment about the prospects for economic growth. Professional investors monitor the yield curve closely because short-term rates have exceeded longer-term ones before each recession since at least 1975—a phenomenon known as an inverted yield curve. 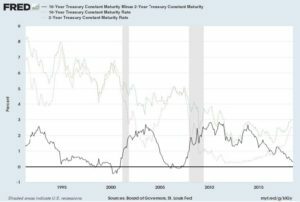 According to data from the St. Louis Federal Reserve, in five of the past six periods in which the yield curve inverted, the economy tipped into recession within a year. While the Federal Reserve has signaled its intentions to raise rates twice more in 2018 and three times in 2019, market participants are unconvinced that the Fed will follow through. 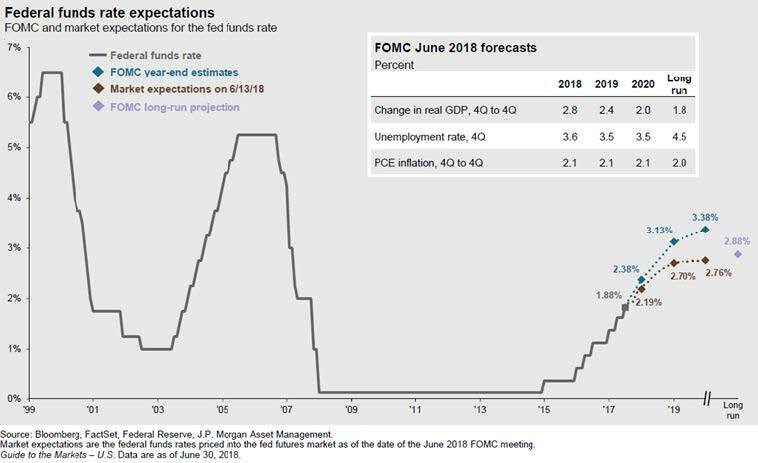 Fed Fund futures are predicting that the Federal Reserve will only hike once more this year, and maybe twice in 2019 (see graph below). This skepticism is perhaps the main reason why longer-term interest rates have stopped rising. 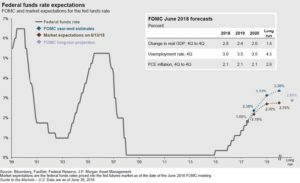 The market simply doesn’t believe that the Fed can be as aggressive in its rate hikes as its statements suggest without causing significant damage to the economy, which would force the Fed to the sidelines and allow interest rates to stabilize. If the markets are correct, and the Federal Reserve is closer to the end of its interest rate hiking cycle, then longer-term interest rates could be at an attractive entry point. 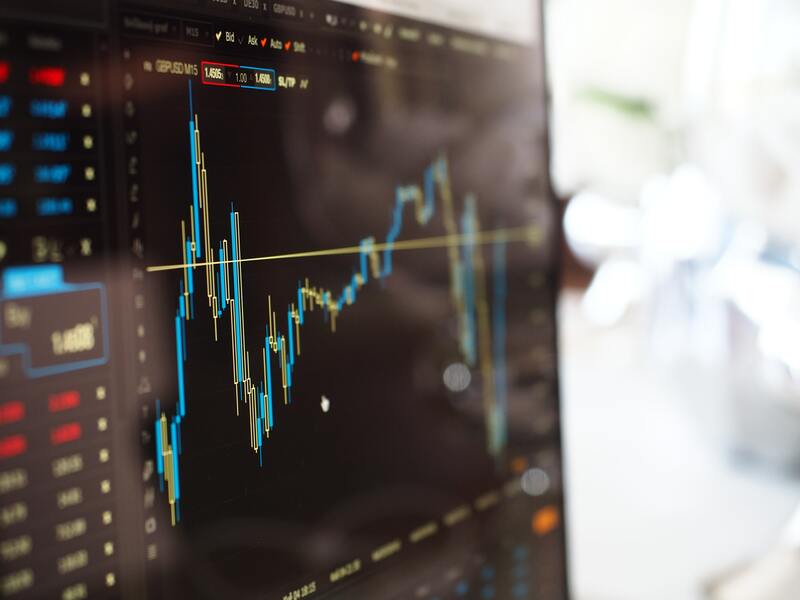 It is natural for investors to be risk averse and focus on the risks of investing in fixed income securities during a rising interest rate environment. However, we should not overlook the compelling benefit: higher interest rates mean higher levels of income from fixed-income investments. Bond prices and interest rates are inversely related. As rates rise, bond prices fall. This relationship has made fixed-income investors nervous; rising rates have been on the risk radar for years now. On the other hand, the single best predictor of future long-term fixed income investment returns is the starting yield. The correlation between the starting yield (yield at purchase of an investment) and the subsequent returns is around 0.9 for long-term Treasuries, both 10-years, and five-years. The lower the starting yield, the lower the future returns over time and the higher the starting yields, the higher the future returns over time. So fixed-income investors have to experience short-term pain in the form of lower bond prices to eventually see higher expected returns over the long term. As bonds mature or come to market, investors can expect to see their portfolio yields rise, and thus, their expected returns. In other words, the only cure for low returns in bonds is higher interest rates, and we finally have higher rates thanks to the Federal Reserve interest rate hikes. Higher interest rates are also benefitting savers who use short-term investments. Over the past few years, anyone looking for income from certificates of deposit, money market funds or savings accounts has been disappointed in their sub-1% yields. Today, with 3-month US Treasuries yielding 1.9%, cash-alternative investments have followed suit, and savers can earn between 1% and 2% on safe investments. While these yields aren’t exactly eye-popping, they are satisfactory for those who would like a little more security with their short-term savings. 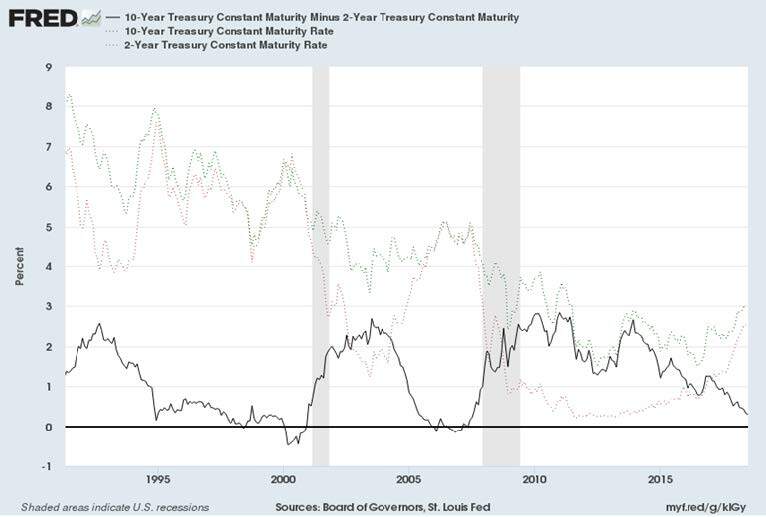 Moreover, given that we are likely to see short-term rates rise a little higher from current levels, savers can more confidently park money in short-term investments and capture slightly better yields over time as the Fed completes its rate hikes. For the balance of 2018, the financial markets will continue to grapple with how aggressive the Federal Reserve will be in hiking interest rates. If the Fed hikes rates too aggressively, it risks forcing the US Treasury yield curve to invert, which has historically been a harbinger of economic slowdown. Given this risk, it is possible that the Fed is closer to the end of its rate hike campaign, and interest rates could stabilize at these higher levels. This bears watching as we move into the second half of the year. Global stocks and large US stocks may produce lackluster results if the US Dollar continues to rise. US small-cap stocks are most shielded from tariffs and trade wars. Bonds have undergone a price adjustment as yields have risen. Portfolio yields (income) will be higher going forward than at any time in the last decade. If bond yields go much higher, they could prove to be attractive to investors and cause some market participants to sell stocks and buy safer bond investments. We are at the late stage of a market cycle, which typically has meant a “blow-off” in stock values to the upside. But the yield curve is signaling to be careful. We believe that higher interest rates in the US represent an opportunity for savers and investors to lock in better income from their investment portfolio. We will be closely monitoring the US Dollar and the yield curve for signs that the US economy is peaking and may see slower growth in the 2nd half of 2018.